Tony Proscio is a planning, evaluation, and communications consultant to foundations and major nonprofit organizations. A long-time contributor to The Communications Network, he is the main author of the Jargon Finder, a collection of foundation and nonprofit jargon excerpted from his three essays Others Words, Bad Words for Good, and When Words Fail. Tony joined The Communications Network to discuss the dangers of jargon and how to avoid them. A lightly edited transcript follows. 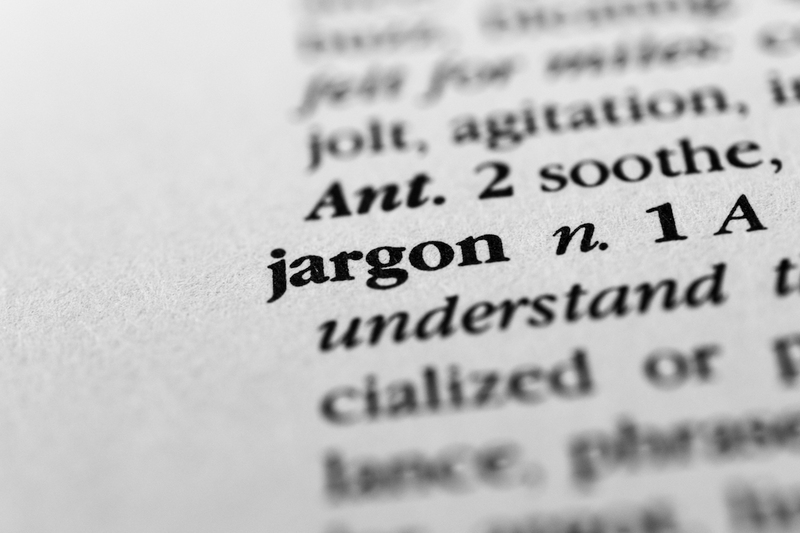 The Communications Network: Let’s talk about jargon and how you define it. What does jargon mean and how does it differ from other words? Tony Proscio: The technical definition of jargon, the strictest, is language that is so technical that a person outside the field, the layperson so to speak, wouldn’t understand it, but that’s not the way most people that I work with think about jargon and it’s not generally the way I use the word either. For me, the definition of jargon is language that stops the reader instead of encouraging the reader to keep going, reader or listener. It’s language that either is grating or hard to figure out or seemingly wrong in some way that makes the reader or the listener stop and, instead of paying attention to your point, pay attention to your language. There are four categories of things like that, that are different from one another, but they all fall under what I think is the general umbrella of what people mean when they use the word jargon. One is technical language as I just said, things that an ordinary layperson wouldn’t know, heteroscedasticity or evapotranspiration or things that you have to be in either the statistics field or environmental science to know those two terms, respectively. One that’s a bit of technical jargon that I think gets in the way of a lot of discussion about healthcare policy is community rating, which most people outside the insurance business would have a limited idea of, but anyway, technical language is one kind of jargon. Then there are vague language words that mean a million different things and therefore in any given context don’t mean anything at all. In our field, words like leverage or capacity, access, those are words that could mean a hundred different things. They’re so broad that in any given context only the speaker or writer really knows what the word means. The poor listener or reader probably hasn’t got a clue. A third is euphemism. Word that don’t really mean what they’re meant to mean. We used to refer to people my age as seniors. That was a euphemism that I found especially grating, but in our field you often hear diversity. Diversity could mean any number of things. It usually means including minorities, immigrants, people who are outside the normal power structure. Incentivize is one of my favorite euphemisms. It usually means pay, as in we’ll incentivize teachers to administer a test. Well, what you really mean is you’ll pay them extra if they do it. The last one, which I think irritates people the most, is cliché. Words that aren’t necessarily hard to understand but are so gratingly common, so overused, so hypnotic in their repetitiveness that they turn people off just by using them. In our field, some of my favorites are things like impact or metrics. I mean, I think most people know what those words mean, but by the fiftieth use of them in any given talk about the public interest your mind starts to go numb. Little pieces start to fall off your brain. In a sense, cliché is the least technical of these four categories, but it may be the most irritating. The Communications Network: Let’s talk more about the relationship between jargon and cliché. Why is cliché so irritating? Tony Proscio: It’s partly the effect of just hearing anything over and over and over again. After a while you just get first bored and then irritated. Hearing the same word used repeatedly gives the subtle, maybe subliminal, impression that the person speaking or writing doesn’t have much of a vocabulary. That is it actually undermines the impression that the writer is trying to give of intelligence or mastery of the subject and instead replaces it with the only word this person knows. We don’t necessarily know we’re doing it. In fact, I may be doing it in this call and you’ll probably get ten emails later saying the jerk was doing exactly what he was criticizing and that maybe because it is a human tendency when you find a word that works, that describes what you want it to describe, you tend to use it over and over again, but it’s a harmful tactic for communication because the effect on the reader is just grating. The Communications Network: When that effect is grating, does the reader stop paying attention, or what are some of the harmful effects of that? Tony Proscio: Well nowadays of course we have some science to tell us how quickly and how easily readers stop paying attention, so sure that’s one effect, but even if the reader continues I really think, and here I have a sample size of one. I’m now telling you my own reaction when I read or listen to the people who insistently use the same words over and over again, I begin thinking there’s less than meets the eye here. I start to doubt the person’s knowledge or wisdom or ability to think in a penetrating way, and I start to think this person might be superficial. It’s unfair usually. I have the privilege of mostly listening to very intelligent people, but when they bang on with the same one or two words over and over again I do find myself losing confidence in them. The worst thing that could happen to you if you’re trying to communicate some things that are a little difficult and needs to be explained. The Communications Network: How do we in our own speech and writing become aware of clichés and root them out, because as you say one of the traps is that often we’re unaware that we’re doing it? Tony Proscio: It is hard to recognize it in your speech. There are times when you use a word and only that word because it’s either politically correct or it’s the standard word in your academic discipline for that idea, and there really is no other word, at least no other word that is common in your field. Those are at least intentional uses of cliché and you can decide how and whether to avoid those, but the much more common one is words you just get used to saying, and all your colleagues say them, and they kind of have a reassuring feeling in your mind when you say them. A little burst of confidence that you get from using the word. There are really only two ways that I know of to avoid that kind of cliché. One is to look at the page and see if there are words on the page that are showing up more than once in a paragraph, more than twice on the page, or even more than once on the page. You can kind of blur your eyes and see that kind of repetition if you’re dealing with writing. In speech, it’s a lot harder. The only way I know of in speech to govern your use of cliché is to find the four or five big ideas that you’re trying to convey in whatever it is you’re going to talk about or write about, for that matter, and think of at least three ways of expressing those ideas that don’t use the same words. It’s hard, but it’s really valuable. If you can at least come up with three different ways of expressing your key ideas, then if you lapse into cliché on some of the other ideas at least you won’t have undermined the main points you were trying to make, and the search for alternative language sometimes has a way of stimulating your imagination. What do I really mean by that idea? What do I really want the audience to hear when I talk about that idea, and finding other ways of saying it helps you start to explore the possibilities that surround any idea. The more technical the idea is the better it is to find different ways of saying it so that it can really seep into your audience. The Communications Network: When people take that step and they find one, two, or three new different ways of expressing a familiar idea, what do you advise people to do? And I think many of our listeners have had this experience when a colleague says, “No, no. That’s not the language we use in this profession, this is how we say that.” How do you address those concerns? Tony Proscio: You have to stand up to them. There is no solution to that but just confidence in yourself, and look, sometimes that’s correct. If you’re writing for a professional journal in your field then you’d better write the way professional readers in that field are going to expect you to write. There the audience expects and wants their standard language and there’s really no penalty for using it; in fact, there’s a penalty for being too clever in those contexts, but most of the time most of us are not communicating solely with the United Nations or the Academy of Climate Scientists or whatever, we’re trying to communicate with people who don’t know our subject or don’t fully appreciate it or don’t know how to act on it, and we’re trying to persuade them of something. Those are the times when yes, you will get that kind of criticism from people in your field and you need to say, “You know, if I want it to be irrelevant I will follow your advice and I know how to do it, but if I want to have an effect on people who are not in this field then I need to talk to those people.” A perfect example of this, whether you like him or not, is Paul Krugman, who gets a lot of heat, both from economists and from other people for taking what are supposed to be lofty technical ideas and putting them in common, even colorful language, but look at the influence he has. You have to decide, I guess all of us have to decide, for ourselves whether we want our bona fides in our field more than we want influence outside our field. If you want to go outside, you’ve got to talk outside. The Communications Network: What about when you’re inside a field, and I think many of our listeners have had experience preparing or writing for academic journals, the language in that world, it’s a world unto itself. What advice do you give to people who want to write in clear, declarative sentences, use active voice, but are told by the academic journal editor that’s not how we do things in this publication? Tony Proscio: Well of course the best advice that anybody ever gives anyone on communication is know your audience and serve your audience. If you have an editor telling you that you can’t publish in this journal unless you write her way, then I think you have to obey the editor. There really is no solution to that. I have occasionally been in situations, analogous situations, where an attorney has said basically you must use this word for legal reasons that I’m not confident to rebut. Well, once the word “must” comes into it, then I don’t think you have much latitude, but at least you’ll know you’re in good company if that happens to you. Early in the twentieth century Bertrand Russell was invited to give a talk at the Philosophy Department at Harvard and he submitted a draft of his proposed talk, which the chairman of the department thought was just fine, but the title of the talk was Words and Things and the dean or head of the department or whatever it was responded that the talk would be fine, but the title simply wouldn’t do. This is an elite Philosophy Department and we can’t have Words and Things for a title. Bertrand Russell submitted a new title, something like Linguistic Correlates of Epistemological Constructs and he was a big hit. If your audience demands that you talk like that then who am I to tell you not to talk like that. On the other hand, I have been in some fairly elite academic departments and listened to some fairly sophisticated talks by people who don’t talk that way. I was lucky in my graduate education to have Uwe Reinhardt, a very distinguished healthcare economist, for a professor. Uwe Reinhardt spoke colorfully. He was funny. He used words in original ways and he used language that even a relatively untutored graduate student like myself could understand and appreciate. I think when you are confident enough and knowledgeable enough in your field you can speak normal English and be a commanding presence, but when an editor tells you you’re not permitted to do that, even Bertrand Russell in the end had to give in. What else can you do? The Communications Network: Agreed, and every writer wants people to pay attention to what they have to say. Most writers hope that their writing will inspire action and another way of talking about that is engagement. We hear a lot of people talk in the nonprofit and foundation world today about engagement. Can you talk about some of the jargon associated or connected with engagement and how that prevents or might be a barrier to people actually getting involved and excited about somebody’s work? Tony Proscio: People often write to me about jargon that irritates them. I seem to have become the unpaid psychotherapist for people who are driven mad by jargon and so I get emails every once in a while. The word that people complain about to me the most often is “advocacy.” It’s not the worst jargon in the world, but there’s something about it that hits people in the solar plexus, and I can only speculate about why, but my speculation equally affects the word “engagement,” which you mentioned. In both of these cases, we’re talking about words that are meant to describe the act of persuasion, involvement, stimulating the imagination or stimulating action, getting people to believe in something enough to want to do something about it, and there is a kind of an aridity, a kind of emptiness to the words “advocacy” and “engagement” that strike exactly the opposite tone to what they’re meant to convey. These are fields, it seems to me, where a degree of passion, originality, inspiration, even whimsy, are necessary. They’re not just useful, they’re really essential for getting people to understand something, care about it and act on it. I think it’s ironic that of all aspects of the work we do in the public interest, the one that’s most about passion and inspiration ends up being conveyed by these arid, empty terms. You’ve just heard me getting into exactly the same kind of diatribe that I hear sometimes or get in my email. The Communications Network: Let’s talk more about that, Tony. What gives a word like “engagement” or “advocacy” such power and popularity and makes it so commonly used? Why do you think that’s so? Tony Proscio: I think maybe because those words sound technical. “Engagement” particularly sounds psychotherapeutic. Advocacy, well I have a different theory about advocacy I’ll mention. I’ll get to that in a minute, but it is, I think, the very dryness of those words that make them popular. If you are trying to inspire people to take some form of political action or social action, to get off their sofas and get involved in something, you may not necessarily want everyone to know that you’re seeking to inspire people that way or doing something that ambitious. This kind of dry language maybe makes the field sound a little less emotional and a little bit more intellectual, and it certainly may make it sound less scary in a political way. I know for sure that the word “advocacy” has gotten traction largely because it isn’t lobbying. Attorneys like the word “advocacy” the way they like public information as a phrase because it seems to convey something that is perfectly permissible legally and ethically and every other way, whereas getting people out to vote or getting people to contact their state representatives or getting people to March on city hall, that can sound a little legally suspicious, so I think it’s a combination of people wanting to sound sophisticated on the one hand and wanting to avoid legal traps on the other, but you can do both of those things without constantly banging on with the same two words over and over again. The Communications Network: In your experience, do you think people get better results when they’re more direct, if indeed they want to inspire others to take action, and they use plain, simple language and avoid phrases like “engagement” or “advocacy,” and will they see better results? Tony Proscio: I don’t see how you can do worse in an effort to inspire or boost people’s enthusiasm. If the objective is to inspire people or to sort of prod them to action, the sounds and the words they hear ought to strike them as coming from friends and allies, not from a disgruntled professor. The whole point of inspiring people to do things is that you reach them at a level that’s both emotional and intellectual. The emotions are stirred by emotional speech and the intellect is stirred by originality. Neither of those things is going to come from a lot of cliché, jargon, abstractions, and technicalities. The Communications Network Excellent point. Let’s talk about people’s own writing. Many of our listeners, Tony, write for a living, and everybody writes in one form or another. What has been your experience and what’s your advice about how to recognize jargon in your own writing? How do we do that? What has worked for you and other writers in reducing the amount jargon in their writing? Tony Proscio: I have four little tricks I use myself, and I think it helps. Other people have told me they help them, so I’ll offer these and then add a fifth that almost nobody ever tries, even though I think it’s the best one I’ve got. The first one is to actually summon up an image of your audience while you’re writing. Not even the whole audience, just someone in it who is likely to need persuading or need explaining. Somebody in your audience who doesn’t get what you want them to get. If you write to that person, it could be somebody you actually know or it could be a composite type, but have someone at the other end of your thoughts, someone that you’re actually communicating with, sometimes who inspires you to be more persuasive, more original, more lively than you would be if the relationship was just you and a blank piece of paper. The second point is to write down your own list of jargon. Everybody knows the jargon in their own field. They may not realize how much they use, but they know what it is. If you make a list for yourself, and I do this in my own writing most of the time, a list of the terms that are likely to sound technical or abstract, that are likely to be overused but maybe are not going to be well understood that are too vague, make that list and then it will be very easy for you to recognize when you are using those words in whatever you write. A third technique, and I use this all the time, but I have had people tell me they just can’t make themselves do it, make an outline. Not for the purpose of absolutely governing what your paper is ultimately going to say or what your speech is going to contain, more for the purpose of writing down short phrases, short clear crisp original phrases that describe the points you want to make. This helps in two ways. First of all it helps you clarify what the point you do want to make is, and second, it starts to supply you with some clear, concise ways of making your point and expressing your core ideas. The fourth one, I’ve never known anyone to use this and not think it was helpful. Read it out loud. There are times when I have gone to bed thinking I wrote something really beautiful, really brilliant. Then the next morning, I read it out loud and I find fifty things wrong with it. It helps to hear what you’re writing because, I believe, it involves a different part of the brain from the part that’s involved in writing stuff, and so it just turns on a new set of speakers, in a sense, for you to hear and understand what you’re writing the way an outsider would. I promised you a fifth one, but nobody ever does this and I think I know why. The fifth one, and I think the very best, is to run a field test. That is, find somebody who is similar to your audience in some way who’s outside your field and who is not your best chum and likely to flatter you, and give them a little sample of what you’ve written. See if they understand it, if they find it stimulating in any way, or if there’s something that baffles them. I think the two reasons why people are reluctant to try this is first of all, it can be really deflating, because most of the time you’ll find that somebody identifies your favorite phrase and says I don’t know what that means. The other reason that people may be reluctant to do this is that they may not know anyone who’s going to be frank enough with them to actually given an honest review. That of course there’s no cure for, but I think if you really believe that you are using language that’s not effective and you don’t know what language that is, running it past a neighbor, a colleague from a different department, somebody who’s smart but not in your technical realm is probably the best way to test your own style. The Communications Network: Those are great suggestions, and I have found number four to be especially helpful. That was the lesson my first boss after college taught me when I was writing news releases for a nonprofit. He would have us all read our material out loud, and the way he put it was if it hurts the ear, it’s telling you something, so, it was a great tip and one I continue to use. Tony Proscio: Yeah, I think hearing something out loud also gives you ideas about other ways of expressing a thought that you don’t have when you’re sitting at the keyboard, because when you start to read something out loud you are effectively talking. That is, you’re having a vocal conversation in a way, and that summons up conversational language. It just sort of shifts your brain into the kind of vocabulary you’d normally use if you were talking, and that vocabulary most of the time is less formal, less abstract, less leaden than the kind of language we use when we’re writing academic stuff. The Communications Network: Who are some of the authors or heroes that you have when you think about people who write well and keep jargon out of their language? Who are the authors that you look up to? Tony Proscio: Well, I’ve mentioned two in the course of this conversation who are both superb and that’s Paul Krugman and Uwe Reinhardt. Now Uwe is not as famous a person, although in economic circles he certainly is, but even their most technical papers, papers that you actually wouldn’t understand, at least that I don’t understand, have an unmistakable flare, and they spend a good deal of their time writing things that you would understand because they want you to understand them. Now both of those people are very prominent economists. One of them, Krugman, has a Nobel prize, so they don’t have to prove anything anymore and they can afford to be a little bit more playful with their language, but they make great examples of how to be eminent and sophisticated and knowledgeable and still speak in plain and colorful English. Now somebody I … It’s hard for me to use the word “admire,” but it’s Frank Luntz. Frank Luntz is the guru of right-wing communication. He has made a, I think deservedly, distinguished reputation as the person who can help conservatives express their ideas in ways that don’t turn everyone off. Now liberals hate him for that reason and many people consider him manipulative, and yes, some of his use of language really is manipulative, but most of what he does is a matter of taking technical or complex public policy ideas and putting them into conversational and colorful English, and I don’t think you have to agree with somebody to see the genius in how they do that. Frankly, sometimes it helps if you don’t agree with them because then you focus on their methods and not their ideas, so I would put Frank Luntz at the top of almost any list of people to read with care and to learn from. Those are three anyway. There are any number of people who write on the outside page of The New York Times, where there is an army of editors ready to help them, and so I often find people about whom I know nothing, about whose fields I know nothing, on the outside page of the Times and I read what they have written with amazement and pleasure because I’m now being exposed to ideas I wouldn’t have known anything about in a language that is clear and simple and colorful enough for me to get involved with. Read it out loud. There are times when I have gone to bed thinking I wrote something really beautiful, really brilliant. Then the next morning, I read it out loud and I find fifty things wrong with it. The Communications Network: In addition to the three people that you mentioned and the editors of The New York Times, are there books that stand out for you on writing, or writing and speaking without jargon, or just using language in general? Tony Proscio: You know, I have to confess, as somebody who has written three very short books, more like booklets, on writing and language, I actually don’t find written advice about language all that helpful. I mean, I’d like to think that some of what I’ve written might have been helpful but I’m not sure that it is really. It might have been more therapeutic than really helpful. It’s a refuge for people who agree with me, but let me give the perfectly obvious answer to this question and try to inject something fresh into it. The Elements of Style is a wonderful little book, and along with Tocqueville’s Democracy in America it is a book that everybody has, everybody claims to have read, and nobody has read. It only takes an hour to read the elements of style, but it takes a lifetime to put all the little wisdom in it to use. If I were teaching a course in writing, something I would shudder to do, I would have students just focus on one chapter of that book for a month and just try to do the things in that chapter. It’s a marvelous little compendium of wisdom and discipline, well worth the effort that it would take to study it for a lifetime. The Communications Network: I actually happened to read it again about a year ago, and along with William Zinsser’s book On Writing Well, they both provide so many ideas that you want to act on, and I could see the improvement in my writing and in my colleagues’ writing. Both of those books reward return visits, and that’s certainly been my experience. Tony Proscio: Oh, that’s absolutely right. I had sort of blanked on Zinsser’s book until you mentioned it but that’s a really fine example, yeah. The reason I think books about writing are not necessarily that helpful, and people have said this to me about stuff I’ve written too, you can come away being more intimidated than enlightened. We all know that our writing could be better. Everyone’s writing could be better. James Joyce said, “A piece of writing is never finished, it’s just abandoned,” so when somebody tells us a hundred ways that we ought to be doing things differently, it can just be a little overwhelming, and so that’s one of the reasons why I fantasize about just focusing on one chapter of the Elements of Style. Fewer rules insistently applied might be easier to swallow and easier to put into practice than a lot of rules, so maybe less is more in this field. The Communications Network: I think we’re coming to the end of our interview. Tony, are there other points you’d like to make, or is there one piece of advice about jargon that you’d like to share with our listeners? Tony Proscio: I think the most important thing we’ve talked about today and the thing that I have put to use the most is the little, what I call the rule of three. When you have a technical idea that’s normally packed with technical language, finding three other ways to say it, I find, is the most useful mental discipline and little exercise in inspiration and inspiring yourself that I’ve found. It can be difficult and it can inspire, as you pointed out earlier, some opposition from people who are worried about the dignity of your field and the loftiness of your vocabulary, but it’s a great way of sharpening your imagination and improving your vocabulary.